To Sum It Up: Since losing her parents as a child, Shadowhunter Emma Carstairs has never given up on avenging them. She’s never believed that they were just two more casualties of the Dark War that claimed many other Shadowhunter lives and severely fractured an already strained relationship with the Fair Folk. Emma’s opportunity for revenge may have finally arrived, though, when a series of murders bearing an eerie similarity to that of her parents draws the attention of the both the Shadowhunters of the Los Angeles Institute and the faeries. It’s not only Emma who has a personal stake in finding the killer, either. Her best friend since childhood and parabatai, Julian Blackthorn, may regain the older brother his family lost to the faeries years before, but only if the Clave doesn’t discover the Shadowhunters’ forbidden involvement in the investigation. Review: It’s a bit hard to believe that Lady Midnight marks my tenth Shadowhunter read. I’ve officially hit double digits with these books; that represents some commitment, indeed. And as beloved as the Victorian-era set Infernal Devices is and always will be to me, I still couldn’t help wondering for a nanosecond if this new Shadowhunter series, The Dark Artifices, would be able to stand out and on its own, especially considering the popularity of the previous Shadowhunter series. Well, after having read Lady Midnight, the answer to that question is a resounding YES. This novel strikes a perfect balance between tying into the rest of the Shadowhunter chronicles and setting off on its own story arc. On top of that, there’s enough of a primer on the world and Shadowhunter history for newcomers who’ve never read any of the other books to be able to jump right in here. While I’m personally of the opinion that it’s best to read all of the books in order for the optimal reading experience, it’s not absolutely essential to do so. Quite a few of the characters in Lady Midnight were introduced in the final Mortal Instruments book, City of Heavenly Fire, including protagonists and parabatai Emma Carstairs and Julian Blackthorn, as well as Julian’s siblings. We catch up with them five years later at the Los Angeles Institute, still very much dealing with the fallout from the Dark War detailed in City of Heavenly Fire that dealt a huge blow to the Shadowhunters’ ranks and all but severed any ties with the treacherous Fair Folk. I was really struck by just how deep the story was here and the multi-layered explorations of its themes of revenge and forbidden love. I’m not saying that I was expecting a shallow plot; when I was done reading I just had one of those aha moments when the power of a book’s storytelling hits you all at once. Emma is touted as the best Shadowhunter of her generation, praise that has previously been bestowed upon one Jace Herondale. Fortunately, Emma isn’t merely Jace redux; she’s a character who’s all her own, and a pretty badass one at that. Emma is a proud Carstairs, determined to avenge her parents, and she wields the Carstairs family sword, Cortana, with both lethal precision and grace. Family plays a HUGE role throughout the book, and oh how the Blackthorns melted and broke my heart. After the death of Julian’s father (by Julian’s own hand during the Dark War), the exile of his older sister, and the taking of his older brother by faeries, Julian has essentially been both mother and father to his younger siblings: twins Ty and Livvy, Dru, and Tavvy. In doing so, he’s had to give up his own childhood and adolescence. I think that anyone who’s ever been a caregiver, whether for someone younger or older, will empathize with Julian. The weight he carries on his shoulders shows at times, but make no mistake: Julian loves his family fiercely, and the Angel help anyone who tries to harm any of them. I absolutely loved the Blackthorns and their love for one another and for Emma, who’s always been an integral part of their lives. Well done, Blackthorn family, on plucking my heartstrings as expertly as Jem Carstairs plays the violin. Although Lady Midnight features the usual assortment of paranormal beings (vampires, warlocks, demons, etc. ), faeries figure largely in the novel. Their betrayal of the Nephilim during the Dark War has led to the Cold Peace; while the two sides are not openly fighting each other, any collaboration between them is not allowed. So when a faerie contingent literally turns up on the doorsteps of the Los Angeles Institute seeking help from the Nephilim, the Shadowhunters have an extremely tough choice to make, especially when the faeries reveal their bait. It’s Julian’s older, half-faerie brother Mark, who’s been their captive for five years. Mark’s return, possibly only temporary and which the Clave cannot find out about, rocks the Blackthorns. He’s a total stranger to them and they to him, a situation only worsened by the difference between the passage of time in the faerie realm and the mortal world. For Julian, Mark’s reappearance in their lives stirs up some bitterness over having been forced to fill in as the oldest brother/parent these past five years, as well as anxiety over the children, Julian’s children really, having their hearts irrevocably crushed if Mark cannot remain with them. Again, I found the Blackthorn family’s story absolutely compelling and poignant. 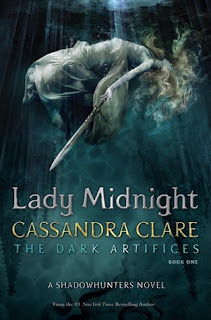 I can’t wrap up this review without mentioning that fans of the other Shadowhunter series should be thrilled by some very special cameo appearances in Lady Midnight. They’re just enough to satisfy your curiosity about what’s been going on since both The Mortal Instruments and The Infernal Devices ended but without upstaging the main characters here. The torch has clearly been passed on to Emma and Julian, and they make their predecessors very, very proud. All in All: I am wholly invested in this new Shadowhunter series and can’t wait to get my hands on the next book! No Shadowhunter series can ever best TID, LOL! But this was very, very good, and it reminded me how much I missed this world. I'm so glad to hear that this book is a strong enough installment to stand well on its own! Like you, The Infernal Devices was a favorite read of mine and was wondering which direction this book would take. It's great to know that family plays a big role and the characters are unique :) Excited for this now! TID forever holds such a special place in my heart! ♥ I think this book is absolutely worth checking out for readers who also loved TID! I didn't find it any more or less YA than the other Shadowhunter books. As for the romance, I'd say it's closer to TMI, just because I don't think any other Shadowhunter series can ever compete with the romance in TID, which was beyond epic.